"Pilot your vehicle through the track. Seek and destroy enemy agents who will use every means to wipe you out. You must avoid the road hazards and protect the friendly pedestrian vehicles. There's terror at every turn - tire slashers, torpedoes, bomb dropping helicopters - standing in your way of the most diabolical collection of enemy agents ever to hit a video screen. You have your skill and reflexes along with Smoke screens, Oil slicks, and Heat seeking missiles to outmaneuver your opponents. One mistake and it's all over. So strap yourself in; no need to check your ammo. You've got more than enough; and take the challenge." --From the NES Spy Hunter instruction manual. 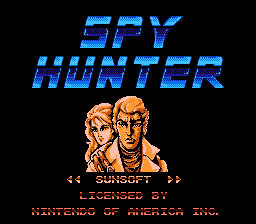 Spy Hunter is a driving simulation game that originally came out as an arcade game in the early '80s. Later it came out for the good old NES. Accelerate you car by pressing up on the control pad and brake by pressing down. Shoot and kill the dark blue cars by pressing B; they are your enemies. But avoid shooting any other cars. You will lose points for doing so. Some enemy cars are bullet proof, and some can spin you right off the road so be cautious. Obtain special weapons by entering red weapon vans. If a nearby weapon van is getting out of sight, press the start button to call it. Once you enter it, you can use your special weapon by pressing A. But be aware that you will only have a small amount. Except for missles which are used to take out helicopters, special weapons are used for enemy cars behind you. If you get far enough, you can take your car through a boat house that will fork off from the main road. You will then become a boat, and you will have the same weapons you had before as a car. You can exit the river and become a car again in a similar way. "1. It is inadvisable to pass enemy agents on a straight road. Try to run them off the road, or wait until there are curves. 2. Oil is one of the most effective ways of dealing with trailing enemy agent ground vehicles. 3. When coming to the forks in the road, try to lure the enemy vehicle to the opposite road you intend to take. The rest is up to you! Good luck."